Oppo F11 Pro on Tuesday made its debut in India, at a launch event in Mumbai. Set to take on the Redmi Note 7 Pro, the F11 Pro packs a dual camera setup on the back, which houses a 48-megapixel sensor, like its Xiaomi counterpart. In terms of the design, Oppo has gone with a fullscreen look on the front with a pop-up selfie camera and triple colour gradient on the back. The company also boasts of the low-light imaging capabilities of the phone and has even packed an Ultra Night Mode in the phone, that is similar to Google's Night Sight. The Ultra Night Mode uses the company's AI Ultra-Clear Engine, which intelligently recognises scenes and optimises the settings. It also helps in image-stabilisation during a long exposure and low-light performance. 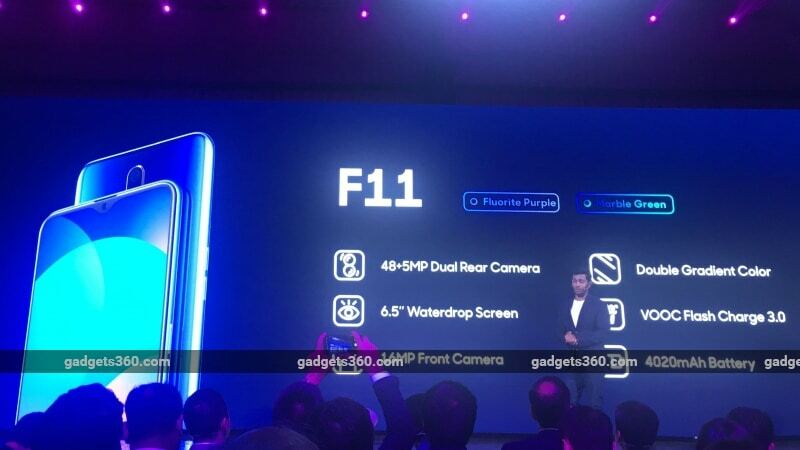 At the launch event, the company also took the wraps off the Oppo F11, which offers similar specifications but is using a waterdrop-shaped display notch instead of a pop-up selfie camera. The phone also differs from the Pro-variant in terms of the RAM, onboard storage, and the back panel design. Oppo F11 Pro price in India is set at Rs. 24,990 for the sole 6GB + 64GB model launched. The phone will be offered in Aurora Green and Thunder Black colour options, starting March 15. The Oppo F11 Pro will be sold via Amazon, Flipkart, Paytm Mall, and Snapdeal, apart from select Oppo retail stores, Bajaj Electronics, Big C, Croma, Hotspot, Go Mobile, Pai, Poorvika, Reliance Digital, and Sangeetha offline stores. Pre-orders begin from today, via Amazon, Flipkart, Paytm, Snapdeal, as well as select Oppo retail stores. In terms of the launch offers, Oppo is offering 5 percent cashback on transactions made via HDFC Bank credit and debit cards, Rs. 3,400 Paytm cashback, and Jio benefits up to Rs. 4,900 with up to 3.2TB of Jio data. On the other hand, the Oppo F11 price in India has been set at Rs. 19,990. The phone will be offered in Fluorite Purple and Marble Green colours. The company has however not shared any details about the availability of the phone. Oppo F11 Pro sports a 6.53-inch full-HD+ (1080x2340 pixels) LCD screen with 19.5:9 aspect ratio and 90.90 percent screen ratio. It is powered by octa-core MediaTek Helio P70 processor, coupled with 6GB of RAM, and 64GB of onboard storage. Oppo F11 Pro will be accompanied by 5GB of Oppo Cloud storage. The company is also touting its HyperBoost tech for speeding up app launch times and optimised performance. The smartphone runs ColorOS 6, based on Android 9 Pie. On the camera front, which is a highlight of the Oppo phone, there is a dual camera setup on the back with a single LED flash. The setup houses a 48-megapixel primary sensor with an f/1.79 lens and a 5-megapixel secondary sensor. In addition, there is a 16-megapixel shooter on the front with f/1.79 lens. Apart from Ultra Night Mode, the company is touting a Dazzle Colour Mode. Further, the Oppo F11 Pro will 4G LTE, Wi-Fi 5, Bluetooth 4.2, GPS/ A-GPS, and a 3.5mm headphone jack. Additionally, there is a 4,000mAh battery (said to deliver up to 12 hours of video streaming) with VOOC Flash Charge 3.0 fast charging, a Micro-USB port, and rear fingerprint sensor on the F11 Pro. As we mentioned earlier, the Oppo F11 Pro will be going head-to-head with the Redmi Note 7 Pro in the country. The Redmi flagship also features a dual camera setup on the back with a 48-megapixel shooter. Additionally, it comes with a 6.3-inch full-HD+ screen, Qualcomm Snapdragon 675 octa-core processor, and up to 6GB of RAM. The Oppo F11 appears to be nearly identical to the Oppo F11 Pro in terms of specifications, but instead of pop-up selfie camera, it uses a waterdrop-shaped notch to house a conventional selfie camera, of the same 16-megapixel resolution. It will be available in Double Gradient colours, featuring a 4,020mAh battery, 4GB of RAM, and 128GB inbuilt storage.